"Sherlock Holmes died fighting Professor Moriarty in the Reichenbach Falls. At least, that’s what the press claims. However, Holmes is alive and well and taking advantage of his presumed death to travel the globe. 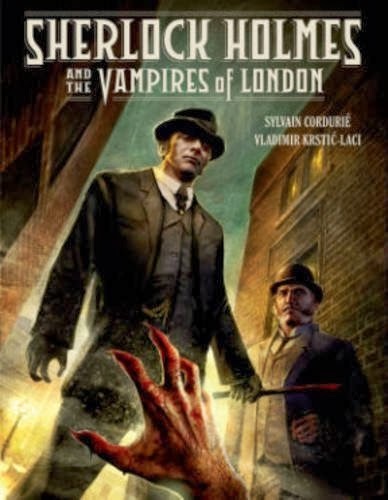 Unfortunately, Holmes’s plans are thwarted when a plague of vampirism haunts Britain." Received an egalley from the publisher through Netgalley. I'm a sucker for a Sherlock Holmes pastiche and love a good vampire story as much as the next person. However mixing Holmes with the paranormal seldom works and while this is a good story and written well, the vampire angle just doesn't fly, imho. Holmes is too logical to so nonchalantly accept that vampires are real and Holmes' analytic character is the foundation of his persona. The era was quite authentic and the author's voice was well-written also. Interestingly, the author avoided having to capture Watson's writing style, by having Holmes himself the narrator recording the events of this story. I enjoyed the art and have a distinct appreciation for French comic art. Overall, good fun Holmes story minus my personal objections I already noted.